It’s actually was trending at couples time ago, but watch stacked bracelets still on top in accessory top list in fashion world. But it will be more stylish if you like to make another style, we mean it redone with a few extra accessories bracelet. 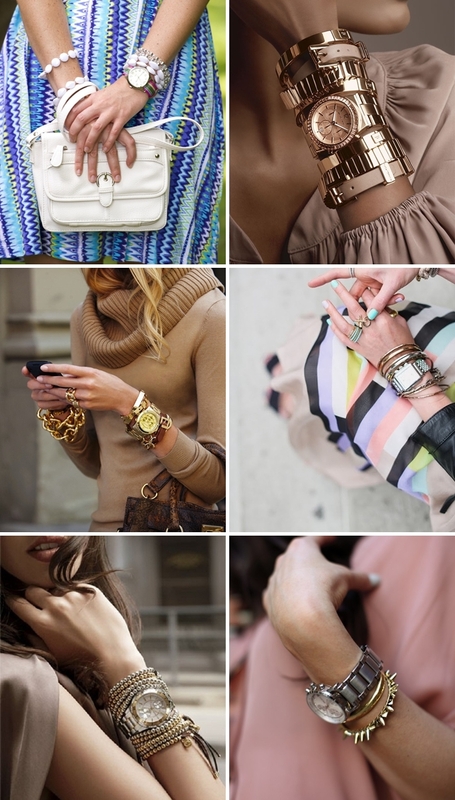 A lot of ways use to serve as adding accessories of watch stacked bracelets. Example: crystal, leather and gold just up to us how to combine them to stacked bracelets. Bracelets, beads, friendship bracelets, watches, cufflinks, studs … There are a lot of stuffs to choose. Expert Stephanie mode Rygorsky suggest starting with a go-to set of five thin metal bracelet, and then mixing the different textures and colors depending on your outfit. 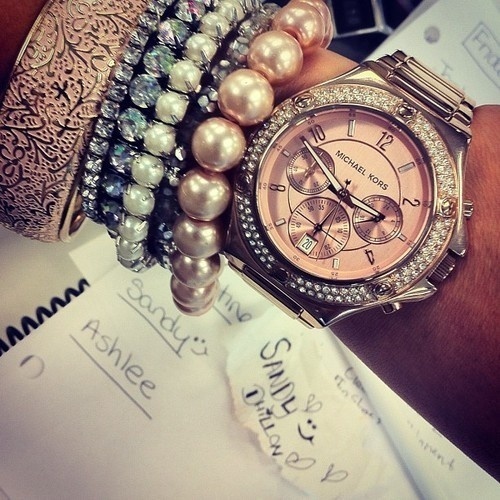 Watches are definitely welcome at an arm party. From a chunky women’s watch to a delicate, feminine timepiece, these touches add a sophisticated vibe to your overall stacked look. As to where you place the watch, it all depends on your own style. “I personally mix my watch in the middle of my bracelets, and like to vary the textures of the baubles to include both metal and leather, string, or rope,” says Rygorsky. If you’re not comfortable with your complete arm covered in jewelry, start with just a few pieces. Rygorsky says an easy way to begin is by “stacking thin bangles in the same color family, or even all black and white bracelets.” And if you’re worried about the noise factor (metal bracelets tend to clang together), switch to “five or six multi-colored woven friendship or rope bracelets tied on one arm,” she says. While you can try an all silver or all gold bangle look, don’t forget about the power of color. “Depending on how bold you are, you can incorporate one color element into an all-metal stacked bracelets, or you can go all out and mix and match several colors on one arm,” says Rygorsky. 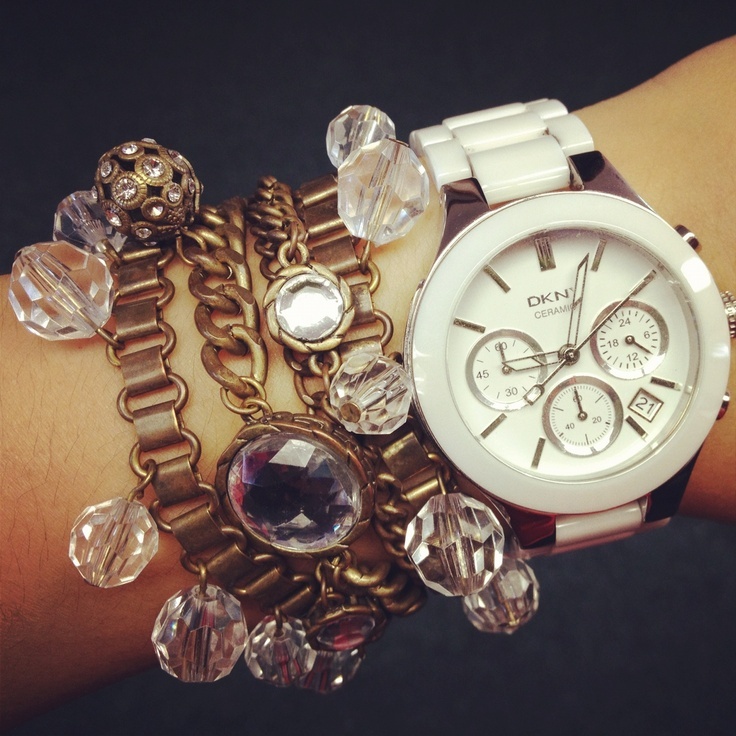 Crystal and gold beaded bracelets is good for layering with the Donna Karan New York Watch. 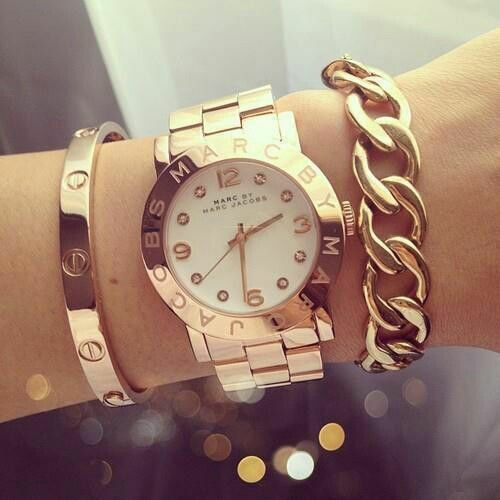 Marc By Marc Jacobs Gold Watch layered bracelets with touch of pastel orange enamel. 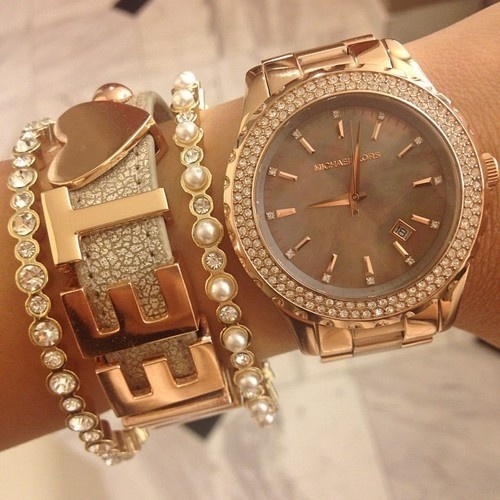 Another Marc Jacob watch layered bracelets with gold theme. Guide how to pair watch layered bracelets. 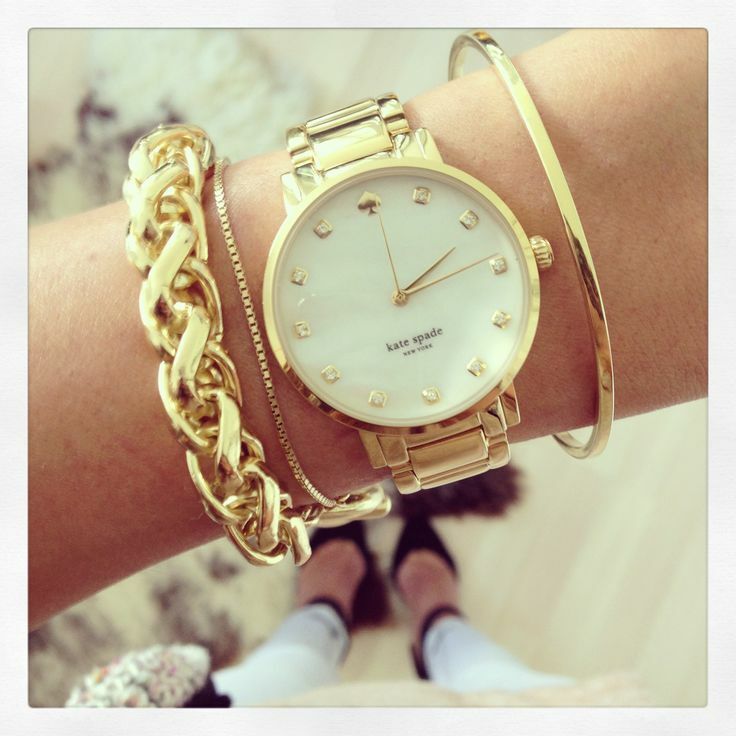 Gold theme in Kate Spade’s watch layered bracelets. And the picture above explaining how to wear watch stacked bracelets in different style and accessories.